Derek Deprey | 7 Reasons to Write a Hand-Written Letter… Today! 16 Aug 7 Reasons to Write a Hand-Written Letter… Today! Think about the last time that you wrote a hand-written letter to someone. How do you think it made them feel? If you’re not sure, try locating some of the notes or cards that you have received over the years. I’m willing to bet that you have some stored in a box, taped on a wall, pinned to a bulletin board, or hung on the refrigerator. Take a moment and read through some of your notes or letters. What specific words did your friends, family members, mentors, and colleagues share with you? If you’re not near any of your old hand notes, visualize some that are memorable. Hand-written letters last forever. If you think that Millennials don’t appreciate hand-written notes because “everything is digital,” think again. Last week, I spoke at an event and asked for a show of hands of people who are inspired and energized by hand-written notes. 100 percent of the millennials raised their hands. Sure email is faster and auto-corrects your mistakes, but hand-written notes don’t get deleted. There is something about them that is real and alive. Are you more likely to save a physical letter you can hold in your hands than an email? The recipient will be surprised. Not all snail mail is junk mail. No one expects to have a hand note waiting for them in their mailbox or on their desk. Don’t wait for a holiday or special occasion. Do you light-up when you see a random hand-written envelope waiting for you? I bet the people in your life do, too. 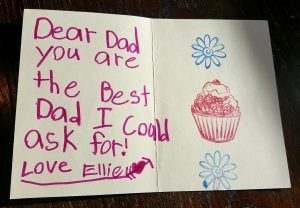 Writing a memorable note doesn’t cost much. Stop making excuses and start making it a priority. Is making a difference in someone’s life worth the cost of a pen, card, envelope, five minutes, and maybe some postage? The writer will receive hand-written letters back. The next hand-written note that you write just might inspire the recipient to write hand-written letters, too. I call this the “Power of One.” Will your next note create a culture of writing many hand-written notes within your family, organization, or network? Catch somebody doing something right. Look up. There is good happening all around you. Don’t overthink gratitude. By the way, you don’t need to insert a monetary gift. When I was looking through all of my old hand notes, the most common theme was, “Thank you for gifting me your time.” Who do you need to praise and recognize today? The recipient will know that you care. People don’t care about the quality of your hand-writing. Instead, they want to know that you care about them. The simple act of focusing solely on them while writing hand-written notes means the world to people. Who needs to know that you deeply care about him or her? The writer will feel energized long-term. You know you’ve made a difference when your hand-written notes are taped to a wall in your colleague’s office and he or she posted a picture of it on social media. I still get goosebumps when that happens. Will the note that you write today end up on someone’s wall? How do you feel? Energized? I’m guessing the people who you’ve written your letters to over the years felt the same way that you are currently feeling. Win-win. The recipient made a difference in your life, and by writing a simple note you can make a difference in theirs. ACTION ONE: True inspiration can start with the Power of One. Write a hand-written note today. ACTION TWO: Consider sharing this article. Just think… If all 6,000 subscribers spread the word, we could send the world a nearly endless ripple effect of positive vibes and appreciation. Purchase Derek’s new book, SHIFT: Move from Frustrated to Fulfilled.